My grandparents had 11 children so our family is quite large – aunts, uncles and dozens of cousins. As a child, the central meeting place for all of our family was always my grandparents’ house. Their doors were always unlocked so that anyone could stop by whenever they felt like it. We spent many Sundays eating a large dinner at noon, while sitting on a wooden bench and drinking ice cold milk. During the warm months, we would sit on the picnic table outside, under the shade of the maple tree that hung a tire swing. My grandmother took great pride in her yard and garden. It was always filled with colorful flowers, decorations and beautiful smells. One of my favorite memories from childhood is in the fall. When the air cooled and the night came early, my entire family would meet at my grandparents’ house to celebrate Halloween. 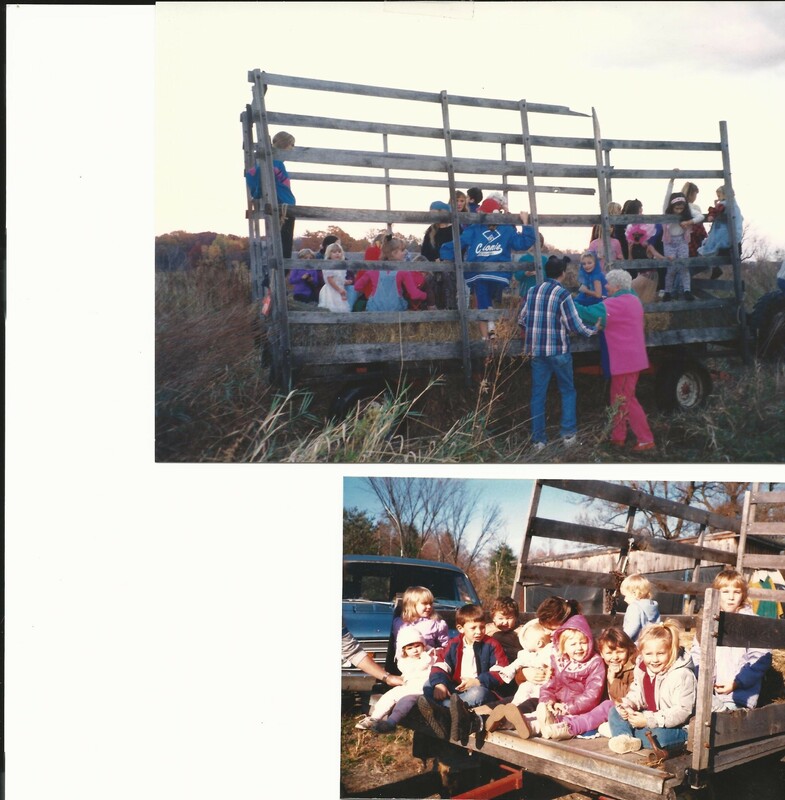 We would dress up in our costumes and load up in my grandfather’s wagon, surrounded by bales of hay. He would hop onto his tractor and we would ride all around their property. Past the vegetable garden that my grandfather grew – now filled with leftover pumpkins, past the old dilapidated barn that us cousins were too afraid to explore in depth, behind the neighbor’s house where we often played. We would splash through the mud tracks where the dirt trail was a little bit lower. The wagon would sway through the divots in the road and we would giggle as we bumped all around. The tractor would pull us farther and farther, until we couldn’t see my grandparent’s house anymore. We would pass the massive maple tree that had lost all of its leaves and steer away from the pond that was surrounded by muck. The hayride seemed to last for hours until the sun went down and it was time to head back. Today we visited a farm and Jacob experienced his very first hayride. Although the weather was much warmer in Florida today, the bouncing seats and bales of hay brought back incredible memories. Jacob sat tall on a bale of hay with his buddy from birth and smiled big. I couldn’t help but feel content. These moments in time, where I am able to take an experience that I loved as a child and pass it along to Jacob makes my heart smile. I hope to continue this tradition every year and I hope that Jacob will grow to love it as much as I do. What tradition from your childhood do you hope to pass along?